Mumford & Sons will pay their first visit to Quebec City, and make their only stop in the province on June 11, with the unique Baie de Beauport as a backdrop. Gestev and Live Nation will present the British foursome with Raury, The Franklin Electric and Patrick Watson. The Mumford & Sons tour gets glowing reviews, and the "Don't Miss" event of Summer 2016 promises to be a magical evening. RTC Shuttlebuses: The best way to access the Baie de Beauport The RTC shuttlebus service will be the best option for accessing the site on June 11. 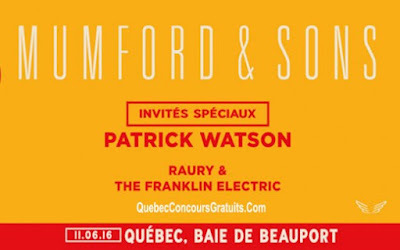 "We are proud of this evening, which showcases the Baie de Beauport and stars Mumford & Sons. We strongly encourage concert-goers to use the shuttlebuses to get to and from the event. I would like to thank RTC for working with us, and I have no doubt that high-quality service will be offered on the night of the event." Michel Granger, Vice President Shows and Creative Content for Québecor Media, said. "The RTC is proud to be associated with this major show. The choice of site is a testament to the confidence Gestev has in the RTC and, thanks to our substantial experience with major events, we will offer Mumford & Sons fans rapid, efficient service right to the venue doors." Rémy Normand, RTC President, said. The RTC will offer a dedicated shuttlebus service departing from 3 free park-and-ride lots: Hydro-Québec (Lebourgneuf area - 410 Shuttle), Atrium (Charlesbourg area - Shuttle 430) and the Galeries de la Canardière (Shuttle 450) in addition to parking at Place D'Youville, which is already well-served by the regular network and has many pay parking spaces. More details are available on the RTC website (rtcquebec.ca). The shuttlebus services will begin operating at 3:30 p.m. Spectators will be able to access the site as of 4 p.m.
A pedestrian walkway will be set up at avenue de la Canardière, and the site will be accessible via boulevard Henri-Bourassa. Bicycle parking will be set up at the junction between the bicycle path and the site entrance. Be aware that boulevard Henri-Bourassa will be closed to traffic as of 2 p.m. on June 11, at the de la Canardière intersection, until the event is over. This same intersection will be used as an unloading zone for taxis. No vehicles will be allowed on the Baie de Beauport site on the day of the event. Only RTC shuttlebuses and the service de transport adapté (STAC) Paratransit service will have access to the site. Street Food Trucks On-siteThe appeal of street food in the Old City is unmistakable, and spectators will be able choose between the approximately 15 trucks on-site, including: Noucy, Le Chic Shack, Les Recettes Paumées and La Shop. The restaurant space will highlight a few local success stories and allow people to taste (among others) the delicious and creative cuisine of La Mangue Verte, top-quality Yuzu Sushi products and the excellent menu from the Les Fistons neighbourhood bistro. Top-Notch ProgrammingMumford & Sons have chosen Live Nation to present all their shows on Canadian soil in 2016. The three stops in Quebec and Ontario in the month of June will be the last in Canada this year. "In 2015-16, the group's tour took them around the entire world. Despite the impressive number of performances, the band is not able to make stops in all of the major cities in the countries they have visited." Jason Grant, their lead promoter at Live Nation, said. "Mumford & Sons' resounding success on international stages means they have the opportunity to play wherever they want to. We are very proud that they have chosen the City of Quebec for their only performance in the province. We are privileged to have the opportunity to present them to people in Quebec at a site as magnificent and unique as Baie de Beauport. We are also pleased that this show is being organized by an acclaimed group such as Gestev which, with its considerable experience, produces several events throughout the province each year. It is this alliance of talent between our two companies that will produce a memorable and very special event." Grant said. Mumford & Sons have had a very busy year on tour, after the release of their third album "WILDER MIND. " Upon its release, the album went to #1 in Canada, and was certified platinum. The British foursome played one last show in England on May 28, prior to crossing the Atlantic. This will also be Patrick Watson's only show in the province of Quebec in the coming months. For their part, members of The Franklin Electric are eager to share the Baie de Beauport stage on June 11. Tickets are still available for this unique event. People interested in attending can purchase tickets at ticketmaster.ca or by telephone, at: 1-855-790-1245. Ticket cost is $82.00 (taxes and service charges included). About GestevGestev is an event developer and organizer founded in 1992 that has made a name for itself in Québec and internationally. Over the years, Gestev has consistently raised the bar for event organization and production. Today, in addition to producing major events such as Ski Tour Canada, Transat Québec Saint-Malo, Jamboree and Red Bull Crashed Ice, Gestev is engaged in experiential marketing and management of sites such as the Baie de Beauport beach. Gestev Spectacles has added a new dimension to Gestev's services, giving it a significant presence in the showbiz and entertainment industry. About Quebecor's Sports & Entertainment GroupQuebecor's Sports & Entertainment Group produces, distributes and promotes diverse cultural and entertainment content featuring Québec and international talent. Sports & Entertainment Group is a fully integrated suite of companies dedicated to delivering the best possible customer experience: the Videotron Centre, Armada de Blainville-Boisbriand, Remparts de Québec and Gestev offer a wide variety of high-quality, multiplatform, convergent content, shows and sporting events.